My Week with Marilyn has the childhood awe factor of Almost Famous, with a touch of Pirate Radio‘s British quirkiness, and a couple of acting performances on par with those from The King’s Speech. When you combine that all together, you get a pretty damn good film. Michelle Williams deservedly received her Oscars nod for Best Actress and Kenneth Branagh certainly earned his nomination for Best Supporting Actor. I’m too young to know a lot about Marilyn Monroe (or even Sir Laurence Olivier for that matter), but after watching this movie I felt like I had been whisked back to era I didn’t live in. Thanks to those two acting performances, at least I was able to appreciate it. This story follows a young man named Colin Clark who is insistent on pursuing a career in film, much to the dismay of his parents. He lands a job with Sir Laurence Olivier’s production company in England, right in the heyday of the 1950’s Hollywood glitz and glamour. 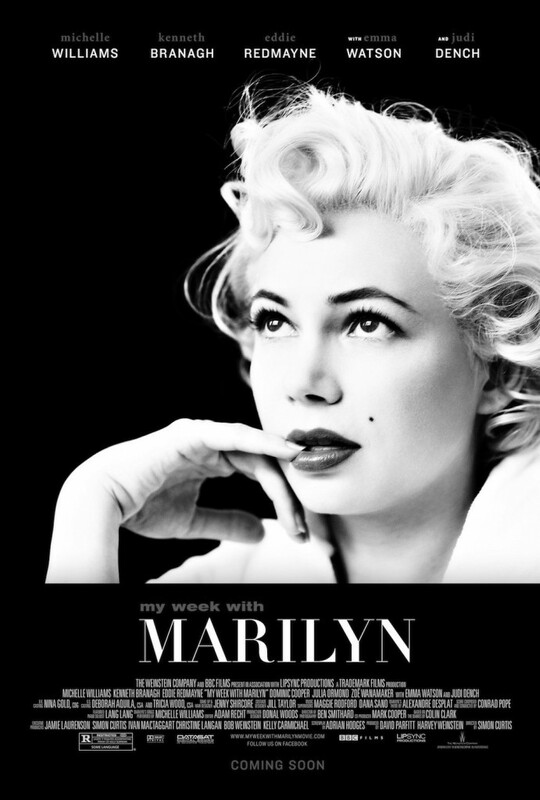 Olivier is the director and lead actor in a film which he decides to cast Marilyn Monroe. Having two of the biggest stars of the time was quite an event at the time, especially ones that came from two entirely different backgrounds and approaches to their “craft”. Clark is a gopher on the set and does whatever is asked of him, including tending to Marilyn on such a fortunate occasion as it’s required from him. The story follows what amounted to a brief fling between the two during the filming of Olivier’s movie, but manages to portray the most uninhibited, in-depth exposition of a woman whose icon status in Hollywood and American lure could not hold up to her mental and physical fragility. The film was taken from Colin Clark’s memoirs which he had turned into a few books. While I can easily see this as being a tremendous read, I cannot imagine how one could possibly appreciate Marilyn coming to life as she did in the film. One criticism I have, which may not have been so apparent in the books, was that Eddie Redmayne (Colin Clark) comes across as difficult to relate with, and not just because he managed to gain the affection of the most desired woman of the time. Maybe he was just exposed alongside two extremely talented actors who put in their best performances, but he wasn’t as likeable as he should have been given the context of the story. He played it a bit too cool considering the circumstances and it left him as the weak link in an otherwise tremendous film.